Rising waters put most of Atlantic City under water on Monday as the approach of Hurricane Sandy flooded towns up and down the New Jersey shore, knocked out power to thousands and left some people stranded in homes inundated with water. Emergency officials said they expected conditions to get much worse at evening high tide when they expect the center of the storm to hit. 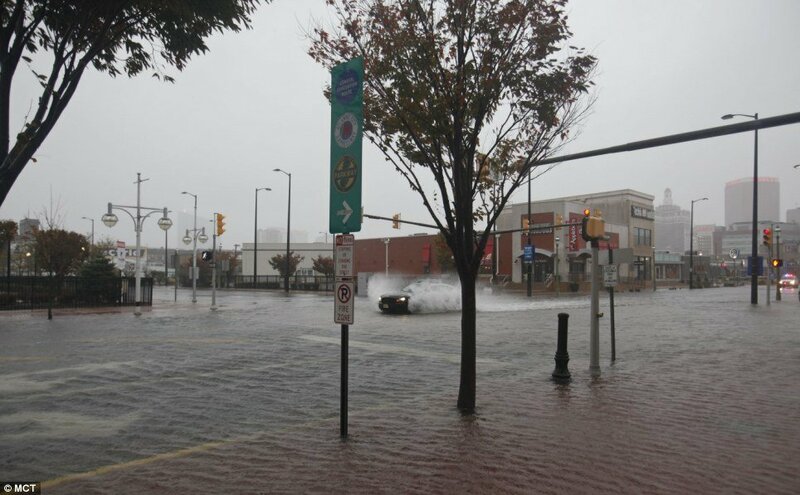 “The city’s basically flooded,” said Willie Glass, Atlantic City’s public safety director. The same could be said of much of the southern New Jersey shore. The storm surge went over the seawall in Cape May with high tide early Monday and punched through dunes in other communities. The Garden State Parkway south of Atlantic City was shut down in both directions. Officials reported rescues in Pleasantville. Hurricane Sandy was just one component of a massive storm coming together over the eastern third of the U.S., bringing damaging wind and flooding and fears of prolonged power outages. By 11:00 a.m. on Monday, the National Hurricane Center indicated that Sandy had strengthened with top sustained winds of 90 mph. The center was expected to make landfall in southern New Jersey late Monday night. “It’s going to be a slog through the history books but we’re doing OK so far,” Willie Glass said. Atlantic City and its casinos were ordered evacuated on Sunday. The city’s historic boardwalk remained intact despite the rising floodwaters, though an old section at the north end broke up and washed away. State Emergency Management spokeswoman Mary Goepfert said about 115,000 residents were ordered to evacuate the state’s barrier islands, and local officials ordered many more in their towns. It was not known how many heeded the warning. She said more than 2,200 people were in shelters statewide. About 35,000 homes and businesses across the state were without power by midday Monday as officials braced for a storm surge that was expected to cause record-breaking flooding.